Sweden has a system of name days: most days on the calendar have one or more given names associated with them. 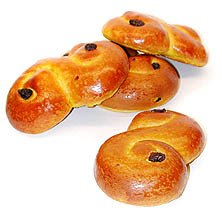 Some days with fixed dates don’t have associated names; these include obvious dates such as 1 January, Nyårsdagen (New Year’s Day), and perhaps less obvious dates such as 25 March, våffeldagen (waffle day). Actually, 25 March is Marie bebådelsedag (Annunciation), previously also known as vårfrudagen (Lady Day), which was apparently misunderstood as våffeldagen. Språkrådet has a nice page about all the days in the calendar. The list of names (namlängden; längd = list as well as length) on the Swedish calendar was substantially revised in 2001 to combine two previous lists as well as take into account changing name frequencies. Today, 29 February, is skottdagen (leap day). The leap day was introduced with the Julian Calendar in 45BC, and originally fell on 24 February. It generally moved to 29 February sometime in the Middle Ages, but this didn’t occur in Sweden and Finland until 2000. Before this, in leap years, names associated with the days 24-28 February were shifted to the following day. Why skott? Usually, fixed dates move forward one day of the week each year, but the effect of a leap day is to move the date forward two days, leaping over a day. In Swedish, skott commonly means a shot (from a gun), or a shoot (of a plant). Skott is related to the verb skjuta, to shoot. This verb has the present/past/supine forms skjuter/sköt/skjutit, but also forms a number of particle verbs, including skjuta in = to interpose, insert, intercalate. Grattis i efterskott! = Belated congratulations! English used to have three words for where: where (location), whither (motion towards), and whence (motion from). Now we rely on context: Where are you going? clearly denotes motion towards, for example. There are several more, you can look them up, but I’ll have some fun in showing you how they are used. Welcome to here; Welcome to home. I’m sure my translation is rather loose, but here’s a good trivia question for you: what are the top 3? The cameraman zooms in on her hand to make sure we get the point?!? But what’s not to like about the way she pronounces viftar armar. That makes sense now, I hope: this is definitely an example of motion towards. Of course there is no week zero. I just thought I’d take this opportunity to comment on my own blog, a meta-post if you like. Those of you who have been following this blog will have noticed there were no posts from 24-Mar until 26-Nov this year. The main reason for this is that I left Sweden, 😦 , so that I no longer have regular contact with Swedish, nor do I have so easy access to my invaluable swedish language consultants (you know who you are!). However, when checking in again on my blog, I noticed a funny thing. Site “views” (that’s what WP calls them) are increasing. My busiest month by far was November-2011, with 934 views. Second place was February-2011, with 687 views. And my busiest day was 22-Nov-2011, with 70 views. If you google “swedish words”, you’ll find me easily. For “spiskummin”, I am second only to wikipedia. In the thought that people may be interested in this topic, I’ve decided to persevere a little further. But I’m changing the numbering system to reflect the actual number of posts, and thanks in advance to those of you who I’ll still be asking for advice! The cold time of year in Sweden is also a common time for people to become ill. Perhaps with the common cold: common cold = förkylning, where kyla = both the noun cold and the verb to cool, whereas the adjective cold = kall. In Swedish, sick = sjuk, and if you’re very sick you may end up in a sjukhus = hospital. Unfortunately, you may travel there in an ambulans = ambulance. 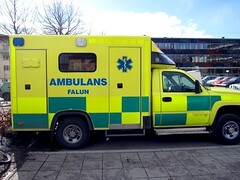 I say unfortunately because ambulance derives ultimately from the Latin ambulare, to walk (seemingly referring to movable hospitals following the troops on the battlefront, for example during the Crimean War in the 1850s), whereas other languages have much more imaginative words for ambulance, such as German Krankenwagen (sick car), Icelandic sjúkrabíll (sick car), and Hungarian mentőautó (rescue car). Sju skönsjungande sjuksköterskor skötte sjuttiosju sjösjuka sjömän på skeppet “Shanghai”. Seven singing nurses took care of seventy-seven seasick seamen on the ship ‘Shanghai’. However, there are more interesting ways to be sick in Sweden. Vinterkräksjuka (literally, winter vomiting sickness) is a viral gastroenteritis caused by viruses of the Caliciviridae family (notably Norovirus, or the Norwalk agent). These are responsible for most cases of epidemic gastroenteritis in adults, so why don’t we have a word for it in English? Maybe that’s why Swedish employers offer sjukpenning (sickness benefit) rather than *krankpenning?